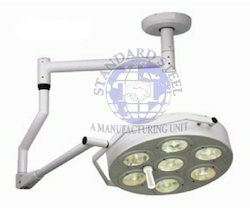 Offering you a complete choice of products which include hospital double dome ceiling ot light, double dome ot light, single dome led ot light, led mobile surgical ot light, double dome ceiling led ot light and surgical examination light. 28” dia dome with 7 reflector & 22” dia dome with 4 reflector of 8” dia in each dome. Fitted with imported halogen bulbs 24v x 70w x 11. S.S. handle fitted out side the dome. Heavy duty Step down transformer. Sterilizable central handle in 22” dia dome. Heat absorbing & color correcting special filter glasses. Lux 100000 + 10% at 90cm. Fitted with imported halogen bulb 24v – 150w in each dome. 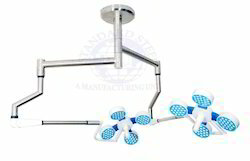 Sterilizable central handle in each dome. Spot Diameter: - 100 - 150 mm. Depth illumination : - 10- 15 cm. Color Temp. : - 3200 - 5200 K.
LED Average Life: - >50000 Hrs. Diameter of Light : - 580mm. Intensity Control : - 10~100 Digital. Power Supply : - 220V/50 Hz AC. Power Consumption: - 40 Watt. Remote function push, On/off and intensity. 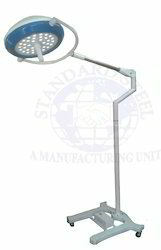 Light in weight, our range of Mobile OT Lights come with wear and tear resistant step down base. 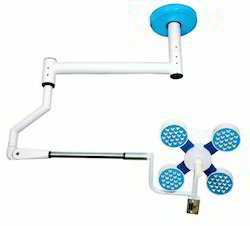 The lights have sterilizable central handle and are known for for their auto spring balance. provided with standby bulb. 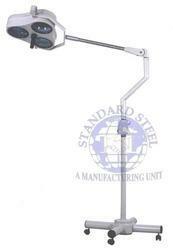 Our lights are offered in various specifications and can be customized as per the specifications of clients. 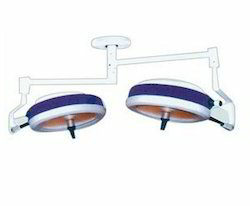 Easy to handle, these durable lights are in tandem with the defined industry standards. 22” dia dome with 4 reflector of 8” dia. Fitted with imported halogen bulbs 24v x 70w x 4. Fitted dicoric glass reflector x 4pcs. 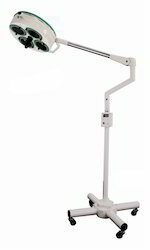 Looking for Operation Theatre Light ?